Desiree Zamorano “ is appalled by stereotypical rendering of Latinas in mainstream literature, saying that true-to-life middle-class Latinas are invisible in the fabric of American culture.” I’d have to agree with her. Whether it be in literature, in the media or TV programming, too often people of color are relegated to the roles that the “mainstream” allows for them. Typically, Latinas are cast as maids or cleaners of some sort, living in low-income neighborhoods, maintaining close family ties. Even in writing from some Latin authors, it seems to be a struggle to create characters that step outside of the set boundaries. 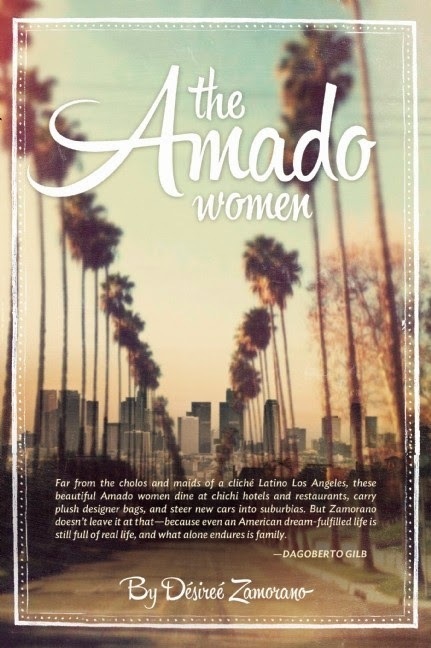 So it’s refreshing to see Zamorano’s approach to the story of three women and their mother in The Amado Women. Having grown up watching their mother struggle when their alcoholic father would use the grocery money to quench his thirst instead of providing food for his children, the oldest two girls create paths for themselves to ensure they’ll never have to struggle like Mercy. Also like their mother, the three sisters have secrets that they tell only to themselves. You had to parcel out your secrets, you couldn’t trust any single person with the entire, authentic you. That was far too risky. Oldest daughter, Celeste, is a financial whiz. She makes money hand over fist for her clients, and herself, but she’s not really happy. Money affords her the creature comforts, but it doesn’t keep her company at night. In this way, she’s very much like her mother. With her three daughters out on their own, Mercy is lonely. She has friends and co-workers, but when she asks to be set up with men, it’s because she’s ready to start the next act of her life, not because she’s joking, as some seem to think. Middle sister, Sylvia, suffers from a need to please people, in particular, her husband. While being Jack’s wife means a beautiful home in the suburbs with the requisite two children, it also means that she has to keep up a happy housewife façade. What was once a loving marriage has turned into a lie filled with secrets and shame. Youngest sister, Nataly, is a struggling artist, the only one of the three sisters who is not financially secure. Working as a waitress to support her artistic dreams, she’s the least grounded of the sisters and the only one willing to entertain a relationship with their father. Because she was the youngest, it’s likely that she was too young to remember her parent’s arguments and her father’s habits. Even though she’s admittedly Mercy’s favorite, she still seeks approval from her failure of a father, leading her to make plenty of bad decisions, including looking for love in all of the wrong places. It’s always interesting to watch siblings interact and how easily they fall into the same roles in the family they’ve always had, even as adults. In this area, Zamorano stays true to the characteristics you would expect based on birth order. Celeste is the typical oldest child who thinks it’s her job to look out for the others. Sylvia is Switzerland, just wanting to keep the peace. And Nataly is the immature, spoiled brat we would expect her to be. While it’s typical for the youngest in the family to be a brat, I can appreciate that the reasons for Nataly acting like this are explored. This is a good, solid read. I'm definitely looking for more from this author.